Event Date : 15 - 16 October 2018. 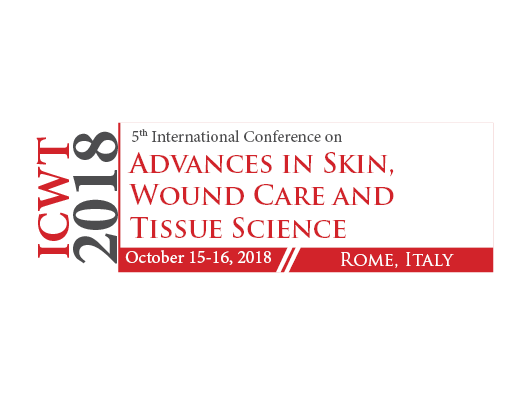 "5th International Conference on Advances in Skin, Wound Care and Tissue Science” which will take place on October 15 -16 in Rome, Italy. Wound healing conference will bring together Wound Care Researchers and practitioners from more than 40 nations to share their knowledge, experience and expertise through a series of Key Notes, Plenary Talks, Workshops, Symposiums and Exhibitions. The theme of this year conference is “Modernization and Innovations in Wound Care Technologies” for Advances skin and wound care conference audience are expected from wide disciplines which includes but not limited to Wound care specialists, Physicians, Pharmacologists, Academic Researchers, Surgeons, Nurses, Diabetologists, Nutritionists, Oncologists, Psychologists and other experts working in the related area of wound care to share their experience at the global platform for the well-being of patients.